In his work The Crisis of the European Union (2012 – reviewed for society.ie here), Habermas argued for the uncoupling of democratic procedure from the sovereign state, on the grounds that the power of nation states to control the forces that substantially govern the lives of their citizens (market forces, natural environmental forces, etc.) is diminishing, with no indication to suggest this trend would be stop or be reversed. Habermas argues that trans-national bodies with a high degree of political power, such as the EU, are better able to control these forces, and therefore should have their powers expanded. Yet the consolidation of power by European institutions at the expense of national institutions does so at the detriment of achieving democratic consensus across Europe, with the issues of importance for one state differing from those of another. The myriad and competing public concerns of the European populace can be identified though the observation of why various referendums pertaining to European issues were rejected by the electorate of member states. The 2005 rejection of the Constitutional Treaty by France and the Netherlands, while yielding the same result, was defeated on starkly different grounds. In France, the commonly determined grounds for rejection was the popular desire to protect the welfare arrangements present in France against the fear of encroaching neoliberal, Anglo-Saxon influenced policies of the EU. For the Netherlands, the fear stemmed rather from a perceived threat to national identity and fears on the potential expansion of the EU to include Turkey. This contrasts starkly to attitude form the UK administration, originally among the strongest proponents of expansion of the EU to include Turkey as a way of forcing a return to a free trade orientated and less Brussels-centred European Union. Here, scepticism arose rather on account of the perceived increasingly bureaucratic and regulatory path being taken by the European Union. As for Ireland, the only state to hold a referendum on ratifying the Lisbon Treaty in 2008, the rejection stemmed rather from the fear of encroaching pan-EU harmonisation of corporation tax rates, coupled with the threat the Lisbon Treaty’s requirement for increased military spending held for Ireland’s neutrality. These were of course not issues of concern for other European states such as France, which openly advocates both the pan-European harmonisation of tax rates and the formation of a European army, going to illustrate the difficulty of combining democracy and competing regional interests within a European project. Dani Rodrik, the acclaimed Harvard economist, highlighted the risks facing the European Union in his ‘Impossibility Theorem’ – the Globalization Trilemma. The Trilemma argues that there can be a combination of any two of Democracy, National Sovereignty and Global Economic Integration, but the maintaining all three together is impossible. By the theorem’s suggestion, democracy is only compatible with a pan-European economic integration if democracy itself is suitably trans-nationalised as well (views espoused by the likes of former Greek Minister for Finance Yanis Varoufakis). Therefore for a European Union pushing for maintained influenced in an increasingly globalised if at times inward looking and nativist world, the pursuit of global economic integration is coming at the cost of either national sovereignty or democracy. While approaching the subject from different perspectives, Habermas and Rodrik both describe the European Union as technocracy as opposed to a democracy, displaying an ‘executive federalism’ of pursuing the European project behind closed doors without any meaningful public debate or scope for criticism (Habermas, 2012, p. 6). Indeed, while the government of Theresa May, derided in Europe for its lack of suitable concessions, needs to negotiate the Brexit deal while relying on a fragile parliamentary majority and conscious of the fact it may need to soon seek public re-election should the administration collapse, the European nomenklatura-esque negotiation team, freed from the inconvenience of popular elections, are able to press whatever line they deem necessary. ‘Quicker and more decisively’ is phraseology for disregarding the priorities of smaller states when they conflict with those of more central states. The tax formula being proposed favours EU states such as France and Germany with large domestic markets, over small export led economies like Ireland’s, with the Irish Fiscal Advisory Council warning that tax harmonisation posed a greater threat to the Irish economy than the departure from the EU of Ireland’s largest trade partner, the United Kingdom. For the moment, the preeminent hostis publicus of the European project is the United Kingdom, following its decision to withdraw from the European Union. Yet it should be remembered that the UK were only able to leave the European Union thanks to provisions passed in the Lisbon Treaty, a treaty that was of course initially rejected by the Irish electorate in 2008. The response of the European Union was to request the Irish electorate to vote again on the same document on the understanding that, as then Taoiseach Brian Cowen apologetically announced, the Irish people did not really ‘wish to halt progress of Europe’. Ireland, while perhaps not as avowedly pro-European Union after the visit of the Troika, are still amongst the most fervently pro-European, with Irish citizens holding the most positive image of the European Union (58%) of all the member states (Standard Eurobarometer 87, p. 19). That such an openly pro-European populace rejected the vision outlined in the Lisbon Treaty should have acted as a wake-up call for European policy makers that people were feeling alienated from the vision being drawn up in Brussels. Rather, the response was to castigate the Eurocritical result as stubbornness, Euroscepticism or even just pure ignorance. 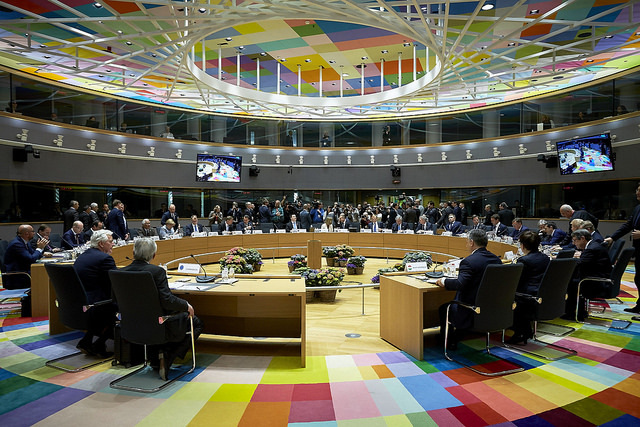 The European Union’s reaction to the Irish rejection of the Lisbon Treaty illustrated the depth of pan-European Union democracy: you can reach any answer, as long as the answer is yes. This is not a railing against the EU. For the most part, the EU has successfully healed wounds and built bridges across the continent, while also providing the framework for economic growth and social prosperity. Yet with Brexit looming, the European Union has a choice of reforming itself to become a more democratic and publicly accountable Union, rather than a Union in which countries are remaining solely on account of their domestic populations not being given the choice that the British electorate was. Britain leaving the EU is a bad result all round – not only for the UK economically and politically, but for the European Union, which bereft of one of its more unwieldy members, is likely to become even less democratic and more strong-headed. If the EU continues on the path outlined by Jean-Claude Juncker in his State of the European Union address, concerns of peripheral states like Ireland will be shut out further in pursuit of a single vision for Europe, shaped to the benefit of the predominant economic powerhouses on the European mainland. The Globalization Trilemma argues that Democracy, National Sovereignty and Global Economic Integration cannot exist together. Democracy is necessary for maintaining public accountability, and the differing and at times even conflicting national priorities with regards economics, tax and the military would indicate the need for the maintaining of National Sovereignty to safeguard these different needs. If this can only be done with less Global Economic Integration, then this is a necessary compromise. The Crisis of the European Union: a response. By Jürgen Habermas. Cambridge: Polity Press, 2012. 140 pp. The Globalization Paradox: Why Global Markets, States, and Democracy Can’t Coexist. By Dani Rodrik. Oxford: Oxford University Press, 2012, 370 pp.